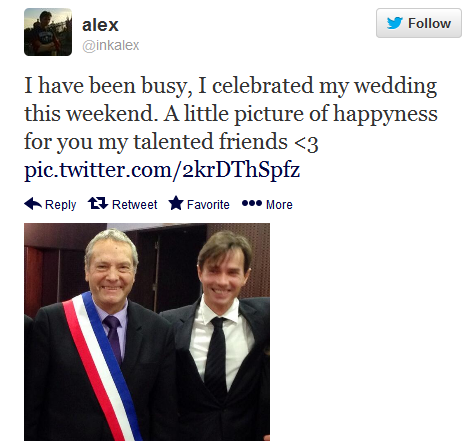 While gay and lesbian couples celebrate in Canberra today, mystery surrounds the second marriage of the French charmer Alexandre Despallieres, announced via his Twitter feed as our picture shows. French police are still investigating circumstances surrounding the death of Despallieres' first husband , the popular Australian music identity Peter Ikin who plunged down a staircase in a French hotel. Despallieres successfully gained probate over Ikin's $20M will and promptly moved into his London house in Chelsea, purchasing 2 Porsche cars for two male friends. Ikin's only relative, a Melbourne based Catholic priest got the will overturned although Despallieres received what is rumoured to be a $200,000 settlement. 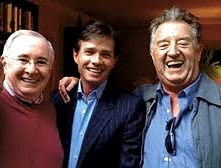 Enter rock managers and Ikin pals John Reid, Elton John's former manager and Rod Stewart manager Billy Gaff who pressured French police to investigate the circumstances of Ikin's death. That investigation is ongoing while Despallieres remains on bail in France. In March this year Despallieres' high profile lawyer Oliver Metzner was found dead from an apparent suicide. No news yet on who his new husband is but he looks older than the ageless Depallieres, as was Ikin.